Say the words “financial planning” to a roomful of high school students and most eyes are likely to glaze over. Most, that is, except perhaps for some who have had their eyes opened by “Funny Money,” a witty, one-hour presentation about personal finance geared specifically to their age group. 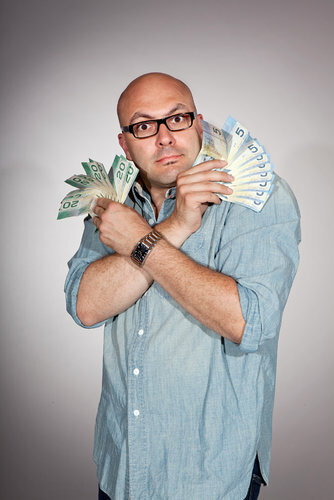 James Cunningham, a Canadian comic who also hosts the U.S. Cooking Channel’s street food show, “Eat Street,” says he created “Funny Money” to help students get savvy about managing their finances. “‘A plan,’ I said. ‘What’s your plan?’ ‘Shoplifting,’ he said. Claire Wheeler, who turns 19 this month, is starting her second year at the University of Toronto. She said that watching “Funny Money” during her final year of high school helped her understand compound interest, and she began putting money monthly into a tax-free savings account and a registered retirement savings plan. In just 60 minutes, Mr. Cunningham addresses savings and budgeting, credit and borrowing, and investing. Mr. Cunningham says he has always been drawn to finance — he began investing in the stock market during his high school years. As the son of an entrepreneur, he realized at an early age that his family’s finances rose and fell with his father’s successes and failures: “I knew I needed a sound financial plan,” he said in an interview. He soon realized there was a huge deficit of knowledge about personal finance among college students, and in 1999, “Funny Money” was born. Mr. Cunningham began offering the program at colleges during orientation week. Its popularity led to a pilot version geared toward precollege students. In 2005, the Investor Education Fund, a nonprofit advisory service founded by the Ontario Securities Commission, agreed to sponsor the program in high schools in Ontario. From there, it spread: To date, it has played to more than 500,000 students across Canada and the United States while thousands more have watched online video cartoons based on the show. This year alone, it will play at 250 venues, but Mr. Cunningham says it’s a gig he never gets bored with.